Syracuse is climbing its’ way back to prominence in college football. 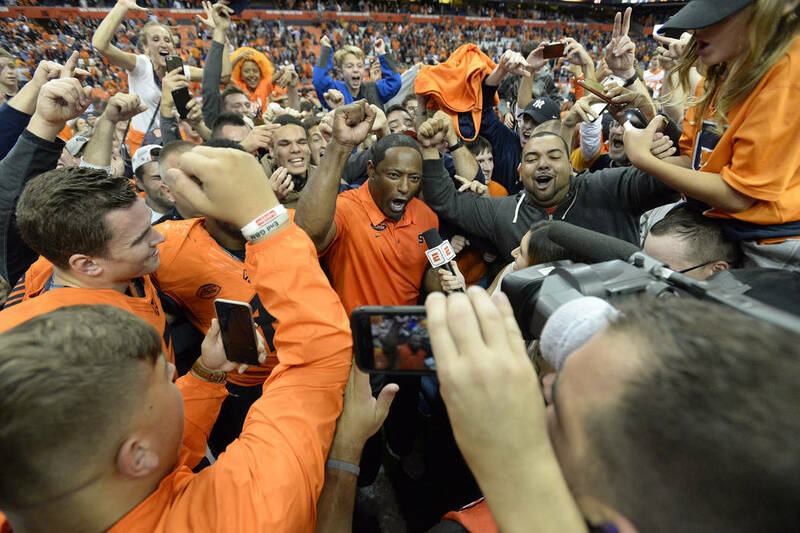 Dino Babers has Syracuse thinking big again on the gridiron. Known more for its’ notoriety as a college basketball power over most of the last two decades during which the Orange went to three Final Fours and won one national championship, Syracuse is re-emerging on the gridiron. In his third year as head coach of the Orange, Dino Babers is resurrecting Syracuse while positioning the program to return to its’ glorious past. That has not been seen since names like Donovan McNabb, Keith Bullock, Dwight Freeney, Rob Konrad, Marvin Harrison, and Donovin Darius dotted the roster from the mid and late 1990’s to the early 2000’s. The chief evidence for the rise of the Orange came last Saturday, Sept. 29, when Syracuse took No. 3 ranked and undefeated Clemson (5-0, 2-0) to the brink of defeat on its’ home field. Only a timely and late rally by the Tigers held off a very game Orange team as Syracuse came up just short in a 27-23 loss. The Orange lead 16-7 at the half and had a 23-13 lead in the fourth quarter before the Tigers rallied with two unanswered touchdowns to pull out the win and drop Syracuse (4-1, 1-1) from the ranks of the unbeaten. That is news in itself as this season’s 4-0 start marked just the fifth time that Orange football opened 4-0 and the first time since 1991. It was a marked improvement for Syracuse which had been outscored by the Tigers 70-6 in its’ last two trips to Clemson Memorial Stadium, including a 54-0 blowout there in 2016, Babers’ first season. This year’s showing against the Tigers proved that the Orange can play with a perennial power that has made the last three college football playoffs and is trending there again this year. Lofty accomplishments like that were mirrored earlier this season on Sept. 15 when Syracuse defeated Florida State 30-7 for the first time as a member of the Atlantic Coast Conference in this there sixth season as an affiliate. The gigantic victory ended the Orange’s 10-game losing streak to the Seminoles and marked Syracuse’s first win over Florida State since 1966 when pro football hall of fame running back Floyd Little played for the Orange. Although Syracuse has been 4-8 in each of Babers’ first two seasons, there has been progress. Babers’ has lead the Orange to landmark victories against teams nationally ranked and at the top of the ACC during each of his first two seasons. Babers ignited Orange Nation on the field after Syracuse beat defending national champion Clemson on Oct. 13, 2017. Orange finished just 4-8 and 2-6 in the ACC a year ago, they were the only team to hand a regular season loss to Clemson which won the ACC Championship and went to the college football playoffs. The win over Clemson was also significant for various other reasons. It was the highest ranked opponent that Syracuse beat since defeating No. 1 Nebraska at the Carrier Dome in 1984. It was also the first time the Orange defeated a team ranked second in the Associated Press poll. Furthermore, it marked the third time in program history that Syracuse defeated the reigning national champion. The other two times came in 1987 when the Orange beat 1986 champion Penn State (48-21) and in 1998 when it beat 1997 champion Michigan (38-28). The Clemson win also marked Syracuse’s first win over an AP top-10 team since a 50-42 win over No. 8 Virginia Tech on Nov. 9, 2002. The keynote victory in 2016 was a 31-17 win over 17th ranked Virginia Tech, that season’s ACC Coastal Division champion. 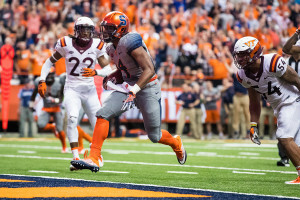 It was Syracuse’s first win over a ranked opponent since posting a 45-26 win over No. 11/10 Louisville which featured quarterback Teddy Bridgewater in 2012. In not yet three full-seasons on the job, all signs show that Babers is building the Orange into a program that can compete annually in the ACC and on the national level for bowl bids. Syracuse fans would welcome that as the Orange have not qualified for a bowl since 2013 when it had its’ last winning season at 7-6 under then first-year head coach Scott Shafer. However Shafer would go 7-17 overall and 3-13 in the ACC over the next two seasons before being dismissed. Babers was hired in December 2015 and has been in charge of the football program ever since. 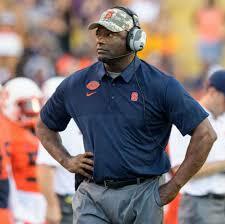 Babers has already re-established the recruiting and personnel trail at Syracuse and the Orange have benefitted. A good example of this is offensive tackle Koda Martin, a 6-6 redshirt senior who came to Syracuse as a graduate transfer from Texas A&M back in May this year. Martin made 12 starts at left tackle and helped clear the way for an Aggies’ offense that averaged 406.8 yards per-game in 2017. Senior Eric Dungey gives Syracuse a dual threat at quarterback with his running ability. Babers has also kept a watchful eye on the quarterback situation knowing that his signal caller, Eric Dungey, is a senior this season. Dungey, who has been the team’s main starter since 2015 but has also missed time due to injury, is a highly capable player and was named a preseason All-ACC Third Team selection by Athlons magazine in 2018. An ACC Honor Roll selection following his junior year in 2017, Dungey owns a school record nine 300-yard passing games and he and McNabb are the only quarterbacks in school history to have 6,000-plus passing yards and 1,000-plus rushing yards in a career. Tommy Devito, a redshirt freshman from Cedar Grove, NJ was a key recruit by Babers to add depth at quarterback and look to the future. DeVito has already paid off for the Orange as he came on in relief of an injured Dungey against Florida State and was an efficient 11-for-16 for 144 yards and one touchdown. 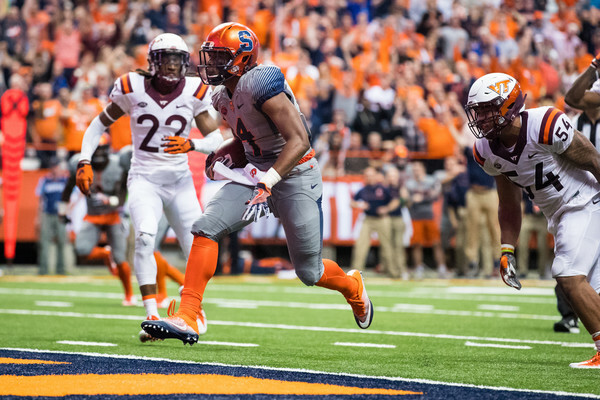 Efficient performances like this are enabling Syracuse to change their fortunes. That and a defense that held the Seminoles to 240 total yards of offense including just 62 on the ground will take you places. Where the Orange are trying to go is to the top of the ACC and into the national conversation of college football on a yearly basis. It will take some time, but Babers and Syracuse are showing the right signs. A competitive spirit. An upbeat attitude. Efficient performances on the field. Strong preparation, scouting, and recruiting. Babers has made football fun again for the Orange and that has not been seen consistently at Syracuse in most of two decades. The Orange have not won 10 games in a season since 2001 when it went 10-3 and beat Kansas State in the Insight.com bowl. In the 16 seasons from 2002 through 2017, Syracuse finished .500 or better just five times. The Orange went 6-6 in 2003 and ’04 in Paul Pasqualoni’s final two years as head coach. Syracuse football then plummeted over most of the next decade. Gregg Robinson succeeded Pasqualoni as head coach in 2005 but could not right the ship. Over four seasons at the helm, Robinson won only 10 games, going 10-37 overall and 3-25 in Big East games. 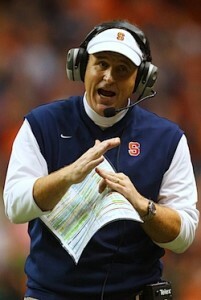 A Syracuse alum, Doug Marrone was head coach of the Orange from 2009-12 before leaving for the NFL. 2010 and 2012. Syracuse won the New Era Pinstripe Bowl each season and some of the glow had been returned but it was short lived. Marrone left to become the head coach of the Buffalo Bills following the 2012 season and the school was onto its’ next head coach in Shafer. Shafer seemed to have a good thing going as he guided the Orange to a 6-6 regular season in 2013 that included decent ACC road wins over North Carolina State and Maryland. Syracuse qualified for a bowl game and beat Minnesota 21-17 in the Texas Bowl that season. Orange quarterback Terrel Hunt scored on a 12-yard run with 1:14 to play lifting Syracuse to victory and was named the game’s Most Valuable Player. The coming seasons seemed promising but Shafer was unable to build on his initial season of success. Shafer won just 10 games over his final two seasons before he was dismissed following the 2015 season. Shafer went 0-6 against conference powers Louisville, Florida State, and Clemson over his final two seasons. Babers was hired in December 2015 and has the Orange on the rise. Since Syracuse joined the ACC in 2013, they have been looking up at the likes of Clemson, Florida State, Louisville, and Miami, the top teams in the conference. These schools have produced two Heisman Trophy winners in the last five years with Florida State’s Jameis Winston winning in 2013 and Louisville’s Lamar Jackson winning it in 2016. Other names like Clemson’s Deshaun Watson, Florida State’s Dalvin Cook, Rashad Greene and Derwin James, and Miami’s Brad Kaaya and Braxton Berrios have been star players at these schools. The Orange have lagged in recruiting athletes in a similar talent mold as these prime players. Clemson, Louisville, and Florida State are all in the same division as the Syracuse, the ACC Atlantic, while Miami resides in the Coastal Division. If the Orange are to continue to close the gap and climb the pecking order of the ACC, Babers will need to get some four and five-star recruits from states like Florida, Georgia, Ohio, and Texas. All indications are that Babers has Syracuse on the right track with quite likely more to come. This season’s team is lead on the field by Dungey, a tough-as-nails player who seeks to get the most out of himself and his teammates. Dungey headlines a core of players who are lifting the Orange out of the ACC cellar. Dungey – who went 24-for-51 and scored both of the team’s touchdowns on one-yard runs in the loss at Clemson last weekend – provides a run-pass threat for opposing defenses. Through five games this season, he is the team’s second leading rusher with 365 yards and six touchdowns. Dungey has also thrown for 1,013 yards and nine touchdowns. Dontae Strickland gives Syracuse experience at running back. Senior Dontae Strickland and junior Moe Neal are the team’s main running backs. Strickland has scored five touchdowns on the ground and gained 172 yards while Neal leads the team with 367 yards and a pair of scores. Seniors Cody Conway and Aaron Roberts along with redshirt sophomore Airon Servais form a steady offensive line that gets additional blocking help from sophomore Chris Elmore who doubles as a fullback and tight end. Elmore is used in short yardage and goal line situations to help Syracuse gain a blocking edge at the line of scrimmage. An All-ECAC First Team selection in 2017 when he started all 12 games at left tackle and had 31 knockdown blocks, Conway helps stabilize the line of scrimmage with his 6-6 frame. Conway and Roberts are both near 300-pounders and give the Orange muscle up front along with Servais who started all 12 games as a freshman in 2017 when he had 36 knockdown blocks. This unit gives Dungey time to survey the field and throw to the likes of wide receivers Jamal Custis, Devin Butler, and Sean Riley along with senior tight end Ravian Pierce. Custis leads all the team’s receivers with 22 catches for 367 yards and 3 touchdowns on the season while Riley and Pierce have two touchdown catches apiece. The kicking game for Syracuse is accounted for by redshirt junior Sterling Hofrichter who handles punts and kickoffs, while redshirt freshman Andre Szmyt is the team’s placekicker. Hofrichter was named to the 2018 All-ACC Preseason Third Team by Athlon and Phil Steele. Safety Antwan Cordy lends big play ability to the Syracuse defense. interceptions, and recovered 3 fumbles during his career. He is supported by a trio of juniors in Evan Foster, Scoop Bradshaw, and Christopher Fredrick along with freshman Andre Cisco. Foster is second the team with 32 tackles while Cisco has four of the team’s eight interceptions thus far in 2018. This defensive prowess explains much of the resurgence by the Orange. 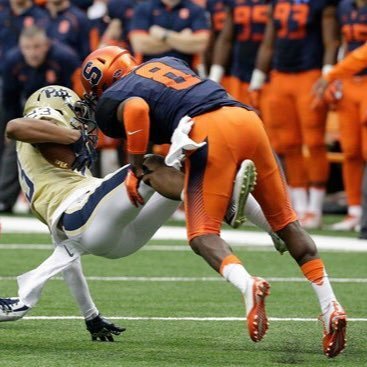 Last season Syracuse was last in the ACC in both sacks and interceptions as they recorded only 16 sacks and four interceptions. In just five games this season, the Orange has 17 sacks which has them tied with Clemson for second in the conference while their eight interceptions leads the conference. On the other side, Syracuse gave up 32 sacks to tie for 12th in the ACC last season. So far in 2018 they have allowed just eight sacks, only the fourth worst total in the conference. All this defensive improvement has translated on the scoreboard for the Orange as they have given up just 21.4 points per-game, good for seventh in the conference through five games. Syracuse was last in scoring defense in 2017 when it gave up 32.2 ppg. Offensively, the Orange are scoring 44.2 ppg so far in 2018 which ties Miami for the top spot in the conference through five games. With a more productive offense and a stingier defense, Babers is molding Syracuse into a program that will have to be reckoned with in the years to come. Since becoming head coach of the Orange, Babers’ mantra is that ORANGE IS THE NEW FAST. Syracuse runs plays quickly and this keeps the defense on its’ heels. This is Babers’ trademark which he brought with him from coaching stops at such places as Arizona, Hawaii, Baylor, Eastern Illinois, and Bowling Green. Redshirt freshman quarterback Tommy DeVito relieved an injured Eric Dungey against Florida State on Sept. 15. 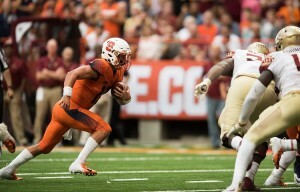 DeVito lead the Orange to a 30-7 win which ended Syracuse’s 10-game losing streak to the Seminoles dating back to 1966. With no seniors among the likes of DeVito, Neal, Bradshaw, Fredrick, Cisco, Servais, Robinson, Coleman, Butler, and Riley, Babers is positioning the Orange to emerge as a yearly contender in the ACC and beyond. Syracuse’s 2018 roster also features several underclassmen who are primed to make an impact as this season moves on and in the coming years. A core of young wide receivers like sophomore Nykeim Johnson along with freshman Taj Harris, Ed Hendrix, Cameron Jordan, and Kevin Johnson Jr. are making contributions now and will likely be heard from much more in the future. Devito is the team’s quarterback of the future while freshman running back Jarveon Howard will help ease the loss of Strickland after this season. The recruiting work by Babers and his staff have also landed good players in freshman defensive backs Trill Williams and Ifeatu Melifonwu along with redshirt freshman linebacker Kadeem Trotter. Coming out of high school, Williams was ranked No. 3 among New York state prospects by 247Sports.com, No. 6 by Rivals.com and No. 10 by ESPN. Williams was also a 2017 New York State Sportswriters Association (NYSSWA) All-State First Team selection. Melifonwu played running back, receiver, and defensive back in high school and was rated 71st nationally among athletes by 247Sports.com. Freshman offensive lineman Qadir White, a 6-7 334-pound offensive tackle will also be a key player in coming years for the Orange. White was a four-star prospect and ranked No. 187 by 247Sports.com’s Top 247 coming out of Cardinal Hayes High School in the Bronx, NY in 2018. White was rated among the top offensive tackles in the Class of 2018 by 247Sports.com (No. 16), ESPN (No. 44) and Rivals.com (No. 59). One other player to keep an eye on is Kevin Johnson Jr. His father, Kevin Sr., played for Syracuse from 1995-98 when the Orange was quarterbacked by McNabb who beat him out for the starting quarterback job. Johnson Sr. was the 1998 Big East Special Teams Player of the Year and was also named a First Team All-American by the American Football Coaches Association. The elder Johnson was a second-round draft pick of the Cleveland Browns in 1999 and played seven seasons in the National Football League with the Browns, Jaguars, Baltimore Ravens, and Detroit Lions. With players like Dungey, Strickland, Custis, Riley, Pierce, Martin, Conway, Whitner, Robinson, Slayton, and Cordy already keying victories for Syracuse, the Orange are heading in the right direction. These players and the aforementioned underclassmen shows that Babers and his staff have done quality work in recruiting and player development. The seeds have been planted and are being nurtured for Syracuse to rise again as a contender on the gridiron in the ACC and beyond. Keep an eye on the Orange the rest of this year and in the coming seasons. The best could still be yet to come.